Although this blogger doesn’t pretend to understand the complexities of civil subdivisions and local government in the northern States, one can state with reasonable accuracy that townships (some States refer to them as towns) have been an important geopolitical unit for several hundred years in New England. In North Carolina, the county has been the basic geopolitical subdivision since the establishment of Albemarle County in 1664. Yet we also have townships. Where did they come from and what use are they? Townships in North Carolina were a direct result of the post-war federal occupation government. A new State constitution, adopted in 1868, sought to place more local political control under elected officials rather than appointed officials. A great review of the history of North Carolina townships was provided in 2009 by Ben Steelman of the Wilmington StarNews. You can read it here. A. Webster Shaffer, a New Yorker, was an officer in the U.S. Army when sent to Raleigh in 1866. He apparently liked it here. Two decades later, he was still residing in Raleigh when he published “The first Township map of North Carolina ever issued.” It’s quite curious that Shaffer would perceive a need for a township map in 1886. Granted, townships were a relatively new concept to North Carolina, but less than 20 years after their legislative creation by the 1868 constitution, townships were already insignificant from a political perspective. Native North Carolinians had regained control of the legislature by 1875 when another constitutional convention wrote amendments, subsequently approved by voters, that essentially abolished any governmental functions of the township. Yet ~140 years later, North Carolina still has its townships, used primarily for locating tax listings and voting precincts. Cram’s Rail Road & Township Map of Nth & Sth Carolina. Please put “Tunison map colorist” on the list of jobs I’d prefer to avoid. 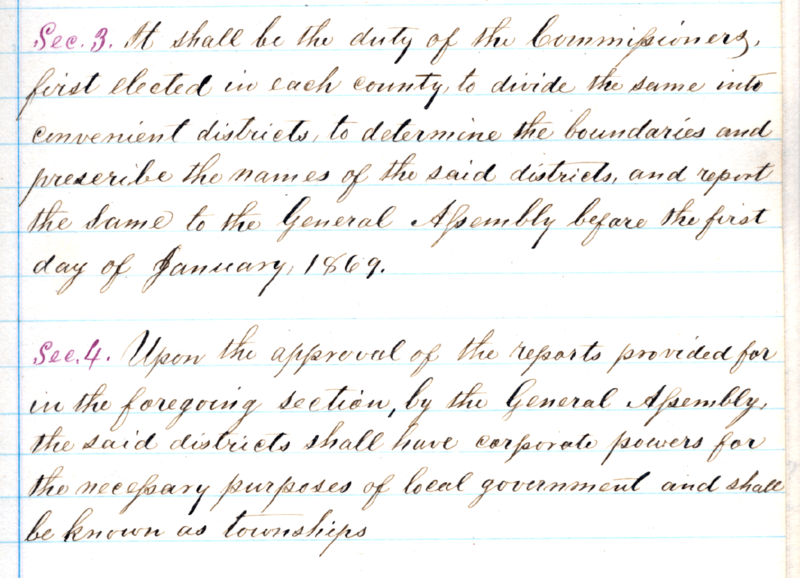 The following are a few paragraphs, pertaining to the creation of civil townships, from Article VII of the original handwritten 1868 constitution, available at http://www.secretary.state.nc.us/pubsweb/ncconst.aspx. This entry was posted in 19th Century and tagged A. Webster Shaffer, North Carolina townships by crmaps. Bookmark the permalink. Do I dare suggest a lack of knowledge of American history? This is a very parochial, even chauvinistic posting. 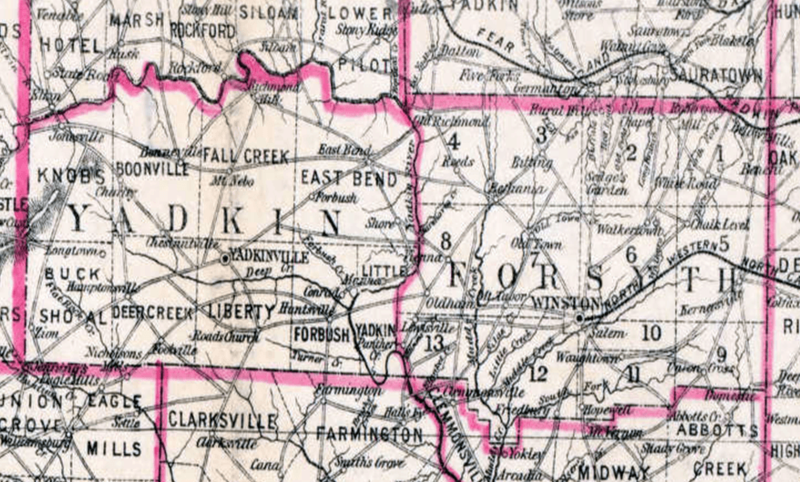 Townships originate in the Northwest Ordinance of 1787. The Northwest territories were surveyed into 1 mile squares called sections. 6 x 6 sections were a township. The township provided the government administration e.g. roads, schools, etc. for the area regardless of whether there was a town in it. In fact, the Ordinance designated two sections as supporting the schools. (I believe this is the origin of property tax supporting schools, but won’t swear to it.) In a time when many more people lived on the land operating many family farms this was necessary . For example, in my home township in Southern Illinois, there were 8 one-room schools at the turn of the 20th C, but no town in the township. Assume 20-25 children per school and you have an idea of how many families were living in 36 square miles. I am not familiar with North Carolina economics at this time. I can imagine that if there were a few large landowners, townships don’t make much sense. It is interesting that there there was an attempt to impose this in North Carolina during Reconstruction. Perhaps the thought was to emulate the Ordinance, which has been credited with contributing strongly to the development of a middle class in the Midwest. There are many interesting questions here. Are the townships roughly 36 sq. miles in area? What were the rules they operated under? How similar are they to those in the Ordinance? etc. A reader replies to John Day. I would like to suggest that you have a lack of knowledge on North Carolina history and a lack of overall understanding of the people of North Carolina (minus the Northerners). To start with, just because it’s done somewhere else a certain way does not mean that is the way it is done in North Carolina. No matter how the town you grew up in in Illinois was laid out, it has nothing to do with the progression of North Carolina and cannot be used as a comparison. From http://www.nationalcenter.org, “The first English Colony of Roanoke, originally consisting of 100 householders, was founded in 1585, 22 years before Jamestown and 37 years before the Pilgrims landed in Massachusetts, under the ultimate authority of Sir Walter Raleigh. In 1584 Raleigh had been granted a patent by Queen Elizabeth I to colonize America.” Roanoke is in Dare County which is in North Carolina. To suggest that North Carolina progressed in the footsteps of the Northwest Ordinance of 1787 and the southern townships of Illinois is, in your words, “very parochial, even chauvinistic”. North Carolina’s first county was was established in 1668. The state of North Carolina was established in 1789. Townships were established 1868-1869 (January 1869 was the deadline given for formation). There were to be in each township a biennially elected Clerk and two Justices of the Peace with various powers. When in 1875, those requirements/powers were taken away it was probably because it was overkill to have so many Clerks and Justices of the Peace. Most of North Carolina didn’t have the population density in their communities that those coming from the North had experienced and/or been raised in. That’s still true today in many parts of North Carolina. To impose the same governmental structure as another region was unnecessary. I suspect however, that the people of North Carolina had found some function in the townships (use for tax jurisdictions) and decided to keep them for those purposes while stripping away any township authority because it wasn’t needed and was never asked for in the first place. North Carolinians are not big on government overkill now and I can’t imagine they were any different in the 1800’s. One last note, I am a female born in Ohio who has lived in North Carolina for 22 years. I found nothing “parochial” or “chauvinistic” about this article. Having lived in Pennsylvania for 32 years where there are not only townships in every county with elected boards and officers and police forces and fire companies and water and sewer authorities–BUT within each township there are boroughs each with elected boards and officers and police forces and fire companies and water and sewer authorities; and within townships and boroughs authorities with appointed boards and sometimes broad taxing and fee waging authorities and with each of the townships and boroughs and authorities having the authority to make roads and sell bonds and leverage taxes and sell arbitrage bonds–believe me, the introduction of townships in North Carolina in 1868 was an effort to create offices and jobs and money authorities and voters and fundraisers and party members on a scale that is today in states like Pennsylvania and Illinois and other states an unbelievable quagmire of political interests and entities. Whereas North Carolina might today be able to count its elected officials in the hundreds or a few thousand, there are thousands upon thousands of elected and paid officials in those states where the township and borough systems exist today. Not saying that it is all bad for representative government. But it sure does create a couple of thousand stages on which politicians can practice their special arts. I could expand, but I’ll stop with one further note. The original blogger picked out two counties (Yadkin and Forsyth) which were strongholds of Republicans from 1865 until well into the 20th century. If there were two places where the imported township system was likely to find rich roots and take hold–these were two of the most fertile spots in all of North Carolina. Fascinating history! My own geneological research in Guilford County benefited from the use of township designations in property records. thanks for pointing out that these references didn’t appear prior to the war of Northern Aggression. Thank you for posting this. I don’t know why my previous internet searches for the history of NC townships has not brought me here until a full 3 years after you published this. I have lived in NC for about 11 years and have always wondered why there are townships that seem to serve no purpose. It’s been driving me mad. I cannot wait to check out the rest of your posts. There are a few reasons why it took your internet searches so long to get you here. The biggest fault is my own. I am not a savvy web page designer or blogger and don’t know all the tricks to get this blog towards the top of search results. Second, it could in part relate to the search engine you used. Although I use Google for my internet searches the vast majority of the time, I have noticed on numerous occasions that Yahoo seems to like the NC Map Blog more than Google. I’ve learned this when doing keyword searches that should result in a specific blog post showing up in the search results. Almost always, Yahoo will put the NC Map Blog post on the first page of search results, while Google puts it much further down the list of results. North Carolina communities are very thin and spread out often not incorporated. Thus Townships are a useful way to designate where some one lives. Marriage records did not always include a town, but usually included the township. The idea to have government within a out and back days travel underlies a lot of the practice sizing government areas.